Warner Brothers is the first company that gets the new distribution model. If I can pay for a DVD and easily get a copy of movies I can play on my computer and portable device, I won't need software to rip copies for me. 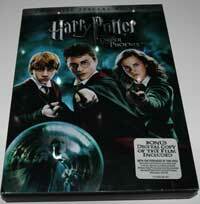 The Harry Potter and the Order of the Phoenix DVD I got in the mail today includes exactly this. Right on the front of the box, there's a sticker reading "Bonus Digital Copy of the Film included". 1) A 320x166 widescreen version for PlaysForSure devices and Zune playback. Both look great on their respective devices. And both eliminate the need to rip DVDs, without adding any additional price to the disk. The only thing better than this would be a disk that came with a download code for Amazon Unbox. In the meantime, you just validate and copy the files to your PC for playback or transfer to your portable device. With any luck, the Harry Potter experiment will work well and we'll see many more disks like this one in the near future. Maybe this is the HD-DVD managed copy concept only a year or two late?